Our seafood not only tastes wonderful, it’s a great source of healthy omega-3 fats, high in protein and rich in vitamins and minerals – an essential part of our diet. One of the major benefits of eating seafood is that it’s packed with vitamins, minerals and other nutrients that keep our bodies in good working order. Seafood is a great source of particular vitamins and minerals which hold very important functions within the body. Oily fish is a rich source of vitamins A and D, which are important in the growth and development of children. White fish is a good source of B vitamins, and all seafood is an excellent source of minerals including potassium, selenium, zinc and iodine. Iodine is needed for our thyroid glands and brain, while zinc keeps us in good reproductive health, and selenium is believed can help to protect us from cancer. Seafood is an excellent source of protein, and also contains small amounts of 'good' fats. Protein-rich fish and shellfish can help to nourish your muscles, as well as warding off colds and flu. Foods with high protein content tend to be low in calories while keeping us fuller for longer. Despite being so high in minerals, seafood is very low in salt and sodium. Most of us eat too much sodium, which has been linked to high blood pressure, strokes and heart disease. Swapping a ready meal that's high in sodium for a seafood dish can help you to lower your salt intake and boost your health. It's also worth bearing in mind that shellfish contains dietary cholesterol. However, saturated fats (which seafood is low in) are much more responsible in causing high blood cholesterol levels than dietary cholesterol, which needn't be avoided unless you suffer from a genetic condition called Familial Hypercholesterolemia (FH) or Familial Combined Hyperlipidemia (FCH). Seafood is also an excellent source of omega-3. Research has shown that eating fish and shellfish regularly is beneficial to our bodies in many ways. 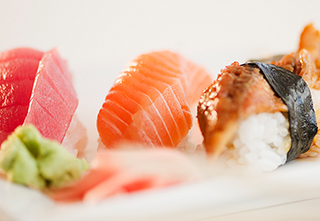 Here are 10 great reasons to introduce a little more seafood into your diet. Eating fish can improve your circulation and reduce the risk of thrombosis. The EPA and DHA - omega-3 oils in seafood can save your body from having to produce eicosanoids, a hormone-like substance which can make you more likely to suffer from blood clots and inflammation. A number of studies have indicated that fish and shellfish may help to protect our lungs. Not only can seafood relieve the symptoms of asthma in children, but it has shown signs of preventing it. Eating a lot of fish can also keep your lungs stronger and healthier as you age, in comparison to those who don't eat a lot of fish. Seafood may also play a large part in preventing depression. Research has highlighted links between low omega-3 levels and a higher risk of depression. Seafood could also help us to avoid Seasonal Affective Disorder (SAD) and postnatal depression. Not only does omega-3 help to protect the skin from the harmful effects of UV damage, but eating lots of fish can also help with the symptoms of skin conditions such as eczema and psoriasis. Fish is also a great source of protein, which is an essential ingredient of collagen, a substance which keeps the skin firm and flexible. Evidence suggests that a diet rich in fish oils can help to protect us against serious inflammatory bowel diseases (BD), including Crohn's disease and Ulcerative Colitis. There is also evidence to suggest that omega-3 could help to slow the progression of inflammatory bowel disease in some sufferers. Due to the large numbers of essential nutrients contained in fish and shellfish, many experts recommend that we try to eat at least two portions of seafood every week. One portion of seafood is generally considered to be about 140g of seafood, or a portion about the size of a fist. There are also limits to the amount of seafood we should eat every week. However, the latest report from the World Health Organisation acknowledges that for most people, the benefits of eating large quantities of seafood far outweigh the potential risks. Source: Seafish – a body set up by the Fisheries Act 1981 to improve efficiency and raise standards across the seafood industry in the UK.